Fly fishing the Gore Canyon section of the Colorado River can provide fly fisherman some of the best walk-wade fly fishing opportunities for large wild trout in Colorado.Gore Canyon has been famous for river running since1869 when Captain Samuel Adams first tried to navigate the isolated river canyon on what was then the Grand River but is now called the Colorado River. This stretch of the Colorado River is formed by a steep, narrow, rocky canyon and access is limited to hardy fly fishing hikers willing to walk up the Gore Canyon Trail or expert rafters and kayakers willing to descend the class 5 whitewater found in the Gore Canyon. The Gore Canyon of the Colorado River is found at the northern end of the Gore Range, southwest of Kremmling, Colorado. Gore Canyon is approximately 3 miles long and is accessed from the Gore Canyon Trail found at the Pumphouse BLM Recreation Area. The Colorado descends from approximately 7300 ft to approximately 7000 ft over the length of the Gore Canyon while steep granite walls ascend approximately 1000 ft on either side leaving the river below fast and difficult to access for fly fishermen. Fishing this section is best done at low flows below 1000 cfs. The canyon is road less and except for the Union Pacific Railroad, running high above the river and a few whitewater boats you not see much besides the abundant wildlife and classic trout water. Despite the short length, the canyon presented a formidable obstacle for the railroad, and the building of the line through it was considered a monumental engineering achievement in its day. The construction of the railroad has added boulders and other hazards that have since made the river even more difficult to access and row safely. But for active hiking anglers, this part of the Colorado River offers wild trout, fantastic scenery and excellent fly fishing. 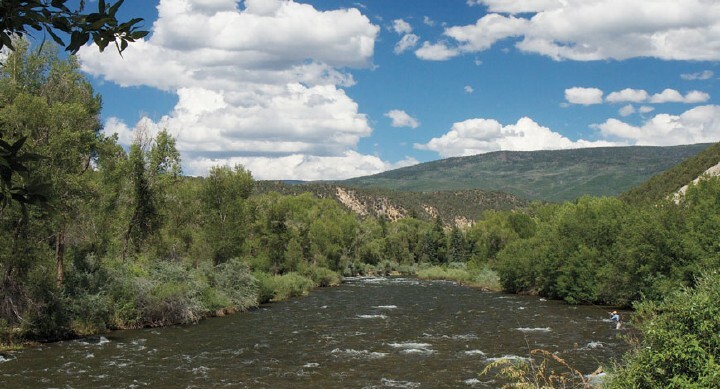 Spectacular views are to be found on the 1.5 mile Gore Canyon Trail for the adventurous fly fisherman. Gore Canyon Trail head is located at the Pumphouse Recreation Area in the parking area for launch site number 1. A sign marks the beginning of the trail and is visible from the parking lot. Although the trail is well maintained and is easy to moderate in difficulty it quickly fades to a steep rocky cliff hanger and is not for everyone. The Gore Canyon Trail meets an impassable rock wall approximately 2.5 miles from the trailhead and never gets you to the end of Gore Canyon but the fishing from the parking area at the trail head is good and only gets as you progress up river. My preference depending on the water level, is to access Gore Canyon for fly fishing, by immediately wading across the river at the Pumphouse parking area. This should only be attempted by strong waders at the lowest flow, 400 to 600 cfs. Please be extra careful on this primitive side of the river and stay just along the river bank. Hiking up to the train tracks above, for access further upstream is a bad idea, the Gore Canyon just gets steeper as you head up river and the steep rock walls coming down from the rail road can slide at any time.If the river is too high to cross there is no need to worry. The trail offers great access to excellent water. Large trout call this canyon home! To find Gore Canyon from Kremmling; travel south on Hwy 9 for approximately 2.2 miles. Turn right on Grand County Road 1. Travel approximately 10 miles on County Road 1, then turn right at the Pumphouse Recreation Site sign. Follow the signs to Launch Site #1. On the northeast side of the launch area you will see the trail head sign. To find Gore Canyon from interstate 70; take Wolcott Exit highway 131 north towards Steamboat 11 miles to State bridge, travel up river 18 miles on Grand county road 1 (trough road) to Pumphouse Recreation Site, keep on dirt access road to boat launch one. There is limited parking at the trail head, with additional parking in designated areas around Pumphouse Recreation Area. Self-service parking fee of $3 is required and camping is located within walking distance of the Gore Canyon Trail. The wild brown and rainbow trout found in the Colorado River, as it flows through the Gore Canyon are beautifully colored, average well over a foot long and fight extremely hard when hooked. Each year the end of May marks the beginning of the most renowned hatch we have on the Colorado River. The Salmon Fly or giant Pteronarcys crawl out of the Colorado River to the banks and emerge out of their exoskeletons and fly. 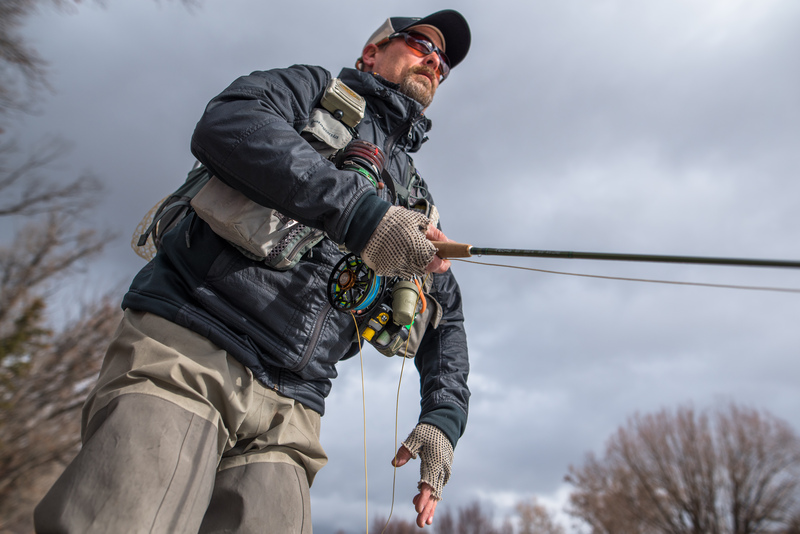 They are the size of humming birds and if catching trout, on the surface with super large imitations sounds like fun, a hike to fly fish Gore Canyon is for you. Unless you hit the hatch dead on you may find yourself having greater success using a size 4 or 6 black stonefly nymphs. 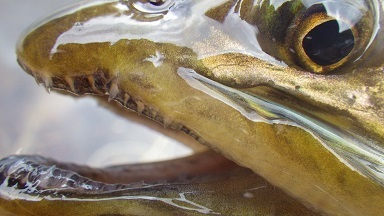 Often, during this salmon fly hatch you will see fish with distended stomachs, so full of Pteronarcys that their fat bellies move with still live insects. The Colorado River may discolor in the spring from small feeder creeks but still fishes well most days because the larger tributaries are dammed up and the Bureau of Reclamation holds the water back each spring, releasing it as needed in the summer months. Fly Fishing Gore Canyon in the spring years ago was a crap shoot because of spring runoff but with todays flow regime it has been much more consistent with lower flows. Stop in Vail Valley Anglers, Edwards, Colorado for the right flies, current conditions or call us to schedule a fly fishing guide. Our guides will carry a day pack with lunch and gear to fly fish all day in Gore Canyon.